Two mega-blockbusters, a few more solid hits, and one or two also-rans to make the other movies look even better. That's the gameplan for May 2010, and it's not out of the norm. The real box office intrigue this month is going to come from a certain big-budget historical epic, and it's not the one you'd think. Welcome to the biggest movie of the year, delivered right smack dab at summer's start, and on the same weekend that's been lorded over by Marvel Comics since 2007 (a spot Marvel's already reserved all the way through 2012, at the least). And what does Iron Man 2 appear to deliver? Solid, efficient sequelizing, making no noticeable mistakes and bringing back everything that worked the first time around, while adding just enough extra to keep us at attention. Aside from the dutiful returns of Gwyneth Paltrow and Robert Downey, Jr. (now a mega-, mega-, mega-star), you've got the occasional casting change (hey, that's not Terrence Howard! 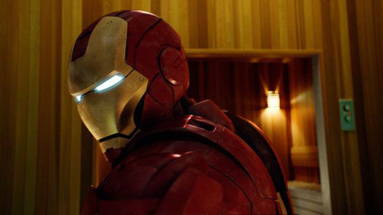 ), and the additions of an Oscar nominee-turned-comic book villain (Mickey Rourke) and a hard-working ingenue (Scarlett Johansson) who finally gets an $100 million movie to her name (and a $200 million movie, for that matter, and $300 million... ) Now, since the original Iron Man opened with that still inexplicable $102 million, I'm at a bit of loss in predicting this one. After all, when the first movie opens like its own sequel should have, what do you do for an encore? How about taking on The Dark Knight's opening record? Good plan. Will Iron Man 2 break that record? You bet. Why? I don't know. Why not?